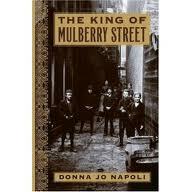 The King of Mulberry Street – In 1892, Dom’s mother puts the nine-year-old on a ship leaving Italy, bound for America. He is a stowaway, traveling alone and with nothing of value except for a new pair of shoes from his mother. In the turbulent world of homeless children in Manhattan’s Five Points, Dom learns street smarts, and not only survives, but thrives by starting his own business. A fascinating story of an exceptional boy, based in part on the author’s grandfather.